During your Hiking, Wine and Dine 8 days tour you will visit Slovenia’s award winning boutique wine cellars. You will also enjoy local food in recognized restaurants and explore Slovenia while taking different outdoor activities such as hiking and different water sport activities. Our Hiking, Wine and Dine Tour also includes a day trip to Venice. The tour takes you around the Western part of Slovenia where the Alps dominate the landscape and where we find vineyards in the hills of the Brda wine region as well as the Karst caves. Visits to fine local restaurants and internationally recognized boutique wine cellars is also an exclusive feature of the Hiking, Wine and Dine Tour. During your 8 days exploring Slovenia you will visit Bled, Bohinj, the Soča river, the Brda wine region, Ljubljana and enjoy different outdoor activities such as hiking, canoeing or any other white water activity. For a day you will cross the border and visit always charming Venice in Italy. Enjoy Slovenia and experience the freedom of life in the mountains and on the river. Enjoy Slovenian local food and taste fine Slovenian wine. The itinerary can be adjusted according to your wishes. Contact us and tell us about your wishes and needs regarding your Active Slovenia tour. The itinerary can be adjusted according to your wishes. Contact us and tell us about your wishes and needs regarding your Active Slovenia Wine Tour. Transfer from Brnik or any other airport and head to Bled, one of the nicest alpine holiday spots. Welcome dinner in local restaurant. Day for exploring charming Bled, with its natural beauties, one of Slovenia’s top attractions. The First stop is Bled Castle (print shop, museum, wine cellar, and chapel), the oldest castle in Slovenia. The view from the castle on the lake below and the mountains range is breathtaking. Admiring the lake from above and than a panoramic drive around the lake and visit island of Bled by the “pletna” boat. Ringing of the bell and making a wish. A short drive to Lake Bohinj, the largest natural lake in Slovenia. Bohinj is a pearl in the Triglav national park that offers many opportunities for outdoor activities. At lake Bohinj there is a lovely Church of Saint John the Baptist. After a short “climb” with the cable car on mount Vogel ,- 1.800 m, a hike on the beautiful mountain range. Traditional lunch of local products while admiring Alps with Bohinj lake in the middle. Afternoon free to enjoy Bled and it’s beauty. Dinner is held at a local restaurant in Bled or Radovljica. Leaving Gorenjska region and drive up to Vršič, one of the most scenic alpine road passes. With an elevation of 1,611 meters, is the highest pass in Slovenia. Upon interest, there is a chance for a short walk to the top of Vršič (an easy, pleasant half an hour walk with breathtaking views). The trip continues with a picturesque drive down the land of the emerald Soča river. Before settling down in Bovec, we will visit the first war museum in Kobarid, to see the permanent exhibition of Europe’s World War I battlefields, with flags, portraits of soldiers etc. The museum covers two and a half years of static fighting. The described events are related to the adventures and memories of celebrities, among whom are Ernest Hemingway and Erwin Rommel. The Kobarid Museum has received the highest national award, it was proclaimed for Best European Museum, and won the Council of Europe Museum Prize in 1993. After settling down in Bovec, a small mountain pearl of the Triglav National Park, there will be time for exploring the Soča river canyons. Half-day hiking tour to Krnska lakes (1385 m), uphill hiking time: 2.5 hours, difference in altitude: 690 m. The Krnska lake is close to 400 m long, 150 m wide and up to 17 m deep. Water activities in the afternoon, such as kayaking, hydrospeed, canyoning, zip line or just walking along the Soča river and enjoying the peace of nature, fresh air and stunning views. Leaving Soča valley and continuing the trip towards Goriška Brda, Slovenia’s most famous wine district. Visit of the Gonjače lookout tower offering a superb view over the endless vineyards, cherry orchards and olive trees. A short walk through Šmartno, a walled settlement filled with narrow streets and artisan shops selling seasonal local food and craft. The first wine tasting of the day at Slovenia’s finest sparkling wine estate. Learning about sparkling wine production process and taste the flavored wine. Continuing the wine tasting by visiting another premium Slovenian wine producer, afterwards serving of a light meal. Free time to explore Brda’s idyllic landscape, nestled halfway between the Alps and the Adriatic Sea, with the abundance of beauty, attractions and experiences. Visit of always charming Venice, the unique and magnificent world treasure. Return to Slovenia in the evening with a dinner of Karst’s flavours. Visit of Štanjel in the morning, taking a glimpse into the history while walking around the picturesque hill village with rows of stone houses. The preserved Štanjel medieval architecture is an excellent example of how people used to protect themselves against the harsh climate, especially the strong bora wind in winter and the lack of water in summer. Arrival back to Ljubljana in the afternoon, the sparkling capital of Slovenia and the final destination of the tour. A guided walk through the old town, highlighted by the works of our greatest architect, Jože Plečnik. 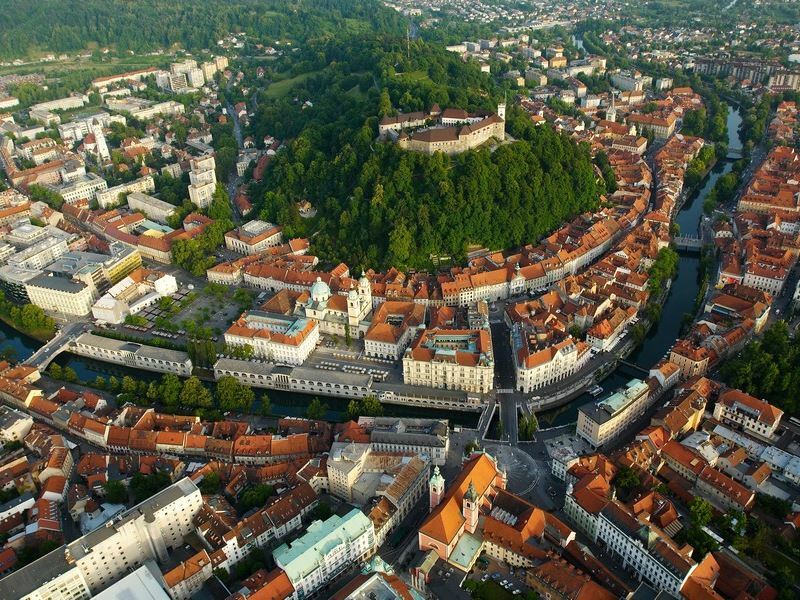 Time to enjoy and explore on your own Ljubljana’s beautiful historic center, contained within a sprawling pedestrian zone that flanks both sides of the willow-lined Ljubljanica River, with animated cafés and restaurants, magnificent Baroque buildings and bridges. 2 – 4 pax: 8 days from 2440 euro per person. 5 – 8 pax: 8 days from 1950 euro per person. 2 – 4 pax: 8 days from 3110 euro per person. 5 – 8 pax: 8 days from 2410 euro per person. For a reservation of the trip, a down payment of 10 % of the estimated final fee is required. The amount is deducted from the final amount of payment. Only after the down payment is received, the reservations of restaurants, accommodations, tours etc. will be done. Upon final confirmation of the program and reservations of all the activities, hotel stays and restaurants the final price of the tour will be set.